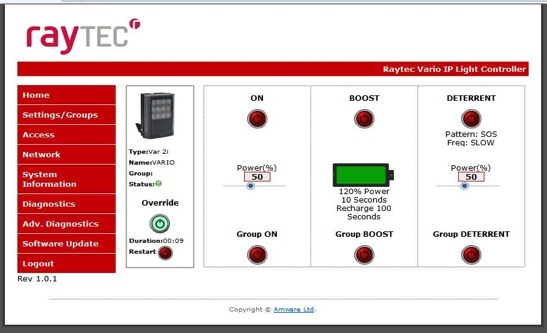 Raytec may have the first ever networked surveillance illuminator. The big question is what this means. What are the practical benefits of an IP based illuminator and is it worth switching from traditional ones? In this note, we look at this new line, how it compares to existing options, and best potential applications. Variable dispersion: Multiple illumination angles may be achieved by installing varying diffuser plates in front of the IR LEDs, so one illuminator model may cover a range of angles. However, to change dispersion, users must physically access the illuminator to replace the lens. Remote control: Power, switching threshold, and other parameters may be adjusted via handheld IR remote control in the original line, and via Ethernet in IP models, eliminating the need to physically access the illuminator via ladder or lift. Area of illumination: Ranges from 15-220m are available, with illumination angles of 10-120°. Lenses for 10°, 35°, and 60° are included. For more fundamentals of Vario, see our original update on that release. For the IP version, while remote control functions are now available via Ethernet, the illuminator requires separate 24VAC power. PoE compatibility is not included in this initial release. The Vario IP line has an MSRP of $675 USD for a Vario i8, a $100 premium over MSRP for the non-IP version. They will be available in Q1 2013. Turning the illuminator on and off. Adjusting the power output from 1-100%. Triggering a "Boost mode" that temporary increases output power, which may be used in case of alarm. In this mode, LED output is raised to 120% for 10 seconds. This allows the unit to better illuminate intruders at the edge of its FOV briefly. Patterns, also used as a deterrent, white light illuminators may be flashed in sequence to create more of a strobe effect than simply boosting output. Boost and patterns may be applied to more than one illuminator at a time, so groups of illuminators in an area may all be increased or flashed simultaneously for increased effect. An API, scheduled for release in Q1 2013, will allow VMSs and other 3rd-party products to integrate control of these functions, as well, so they may be triggered from the VMS interface, used in conjunction with alarm actions, etc. However, no VMS integrations are complete now (January 2013). The original Vario line was priced competitively with other major illuminator manufacturers, such as Bosch and Iluminar. The addition of network control increases will place the IP Vario slightly above these competitors (~$100 USD MSRP), though neither offer the variable lensing or remote control features of the Vario line. NuOptic is controlled via RS-422/485 serial only, with no network connectivity. NuOptic allows adjustment of the illumination angle on demand, as opposed to the Vario, which requires users to physically change a lens in the unit. The Vario allows for control of a group of units, where NuOptic does not. Control is of a single unit at a time. For a $100-150 premium, some users may prefer the variable angle of the VIS, as it may more closely match the field of view and be changed without accessing the illuminator. However, NuOptix comes with its own installation challenges, since RS-485 cabling and configuration are required in addition to power. Raytec also informs us that they offer full design and support assistance to integrators. This includes not only technical support, but 2D and 3D modeling of both white light and infrared illuminators, including target illumination level, not common among illuminator manufacturers. Currently, the Vario IP's network functions seem most useful for installation and maintenance purposes, instead of live operation. Often, illuminators may be mounted during the construction phase of a project by electrical contractors or lower-level technicians, while final setup and commissioning may not be performed until days or weeks later. The ability to remotely adjust power output during this process, or to compensate for issues found when the system goes live reduces the site visits and the need to physically access the unit for these adjustments. Additionally, troubleshooting information such as LED status, input voltage, etc., may allow a tech to diagnose issues and order replacement without being on site. When VMS integrations are complete, Vario IP's potential will be greatly increased, especially as more remote zoom cameras come to market. The ability to adjust output power to compensate for changes in the FOVs of these cameras will be useful for assuring quality nighttime video, without overexposure or blooming. Additionally, those using white light illuminators may find patterns to be a useful addition during alarm situations, if they could be triggered easily from the VMS.